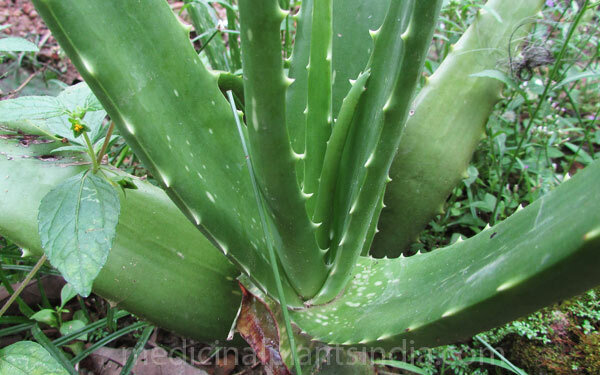 Aloe vera, commonly known as Kumari or Kattarvazha is a stemless, perennial, Acaulescent herbs, with the short stem and shallow root system. Leaves radical, 30-60 cm long, fleshy, in rosettes, sessile, glaucous-green, often crowded with horny prickles on margins, narrowed from base to apex, surface pale green color with irregular white blotches, inside of the leaf contain a white jelly-like substance. Inflorescence 90-135 cm long, simple or few branched, racemes terminal, up to 40 cm long. The flowers are yellow or orange, about 2.5 cm long, produced on a spike up to 90 cm tall. Fruits loculicidal capsules, 1.5x1.0 cm, cylindrical or ellipsoid-oblong. Dried pulp of leaves(Eliyo) - 'Angady' medicine is available in the market named 'Chenninayakam-ചെന്നിനായകം' which can be used instead of fresh leaves, which is a bitter taste, black in color when dried. this is medically important in Ayurvedic treatments. To treat skin disorders, to treat dandruff, arthritis, scalp, diabetics, high cholesterol, Wounds, cuts, liver, kidney bladder disorders. Mucopolicaride, Barbaloin, beta-barbaloin, capalo-resino-tannol combined with p-coumaric acid. Dandruff - Apply jelly of aloe vera leaves on the head and keep it for half an hour and washed out, repeat this for three days. Wounds - Juice of leaves are mixed with turmeric powder and applied on wounds. Leucorrhea - to treat white discharge of women- take leaf juice with cow milk or goat milk.